Barcelona chair was exclusively designed by Mies van der Rohe for the German Pavilion, that country's entry for the International Exposition of 1929, which was hosted by Barcelona, Spain. An icon of modernism, the chair's design was inspired by the campaign and folding chairs of ancient times. An enormous responsibility rested on van der Rohe's shoulders to produce a very special building which would unmistakably announce the resuscitation of cultured Germany's prowess, and adequately showcase their creative achievements and commercial viability. The renowned sculptor George Kolbe's work was shown to great advantage in addition to the Barcelona Chair, Couch, and Table. By transposing an ancient and regal design into a modern setting, the designers enjoyed instant acclaim. The chair was shown off perfectly in the environment of the Pavilion. Royal visitors, it is said, did not actually take advantage of this newly designed seating accommodation, but the chair quickly attained the reputation of being "a design worthy of kings". The functional design and elements of it that were patented by Mies in Germany, Spain and the United States in the 1930s have since expired. The Barcelona chair was manufactured in the US and Europe in limited production from the 1930s to the 1950s. In 1953 van der Rohe ceded his rights and his name on the design to Knoll, knowing that his design patents were expired. This collaboration then renewed popularity in the design. Although many architects and furniture designers of the Bauhaus era were intent on providing well-designed homes and impeccably manufactured furnishings for the "common man," the Barcelona chair was an exception. It was designed for the Spanish Royalty to oversee the opening ceremonies of the exhibition and described by Time magazine as inhabiting "his sumptuous German pavilion." The form is thought to be extrapolated from Roman folding chairs known as Curule chair Curule seat - upholstered stools used by Roman aristocracy. And despite the industrial appearance the Barcelona chair requires much hand craftsmanship. 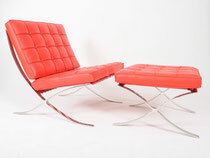 Since 1953 Knoll Inc has manufactured the chair. They make the frame in two different steel configurations, chrome and stainless. The chair is almost completely hand-laboured, and Ludwig Mies van der Rohe's signature is stamped into each chair. Unauthorized reproductions proliferate worldwide and are sold under different marketing names.